John S. Brana's collections of distinctive handcrafted designer jewelry include beautiful, one-of-a-kind pieces designed to set the wearer apart from the crowd. John creates all of his jewelry in his San Francisco studio and works in sterling silver, fine silver, 14K gold-filled wire, 14K – 24K gold, copper, and silver and gold Precious Metal Clay. 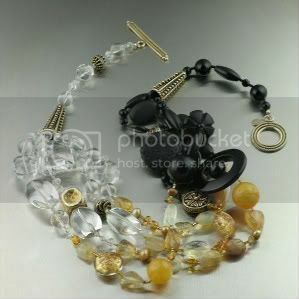 Round smooth Crystal Quartz beads graduate into freeform Amber, 24K Gold Foiled Venetian Glass, and Pineapple Quartz, which crescendos into bold round and faceted black Onyx, Buffalo Horn, and Lava beads. 24K Gold Vermeil beads accent the necklace with a touch of sparkling shine. Measures approximately 23 inches in length. 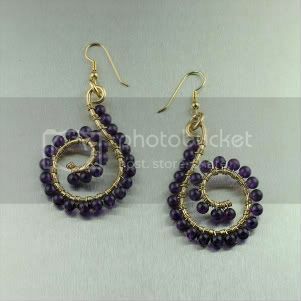 Polished 14K Gold-filled spirals are hand-wrapped with round Amethyst beads, creating a daring dimensional look that complements any outfit. A cluster of smooth Amethyst, Yellow Jade, Prehnite, and Freshwater Pearls, and faceted Amethyst, Yellow Quartz, and Prehnite beads cascade throughout this one-of-a-kind necklace. The elegant combination of soft pastel colors are sure to bring out your flawless feminine features. Measures approximately 24 inches in length. Brana's original designs incorporate sterling silver and vermeil beads, faceted gemstones, freshwater pearls, Venetian glass, hand-carved precious and semiprecious gemstones – all carefully selected during John's frequent trips to Europe, Asia, and throughout the United States. Whether classic or contemporary, each piece is unique, meticulously handcrafted, and made from top-quality materials. 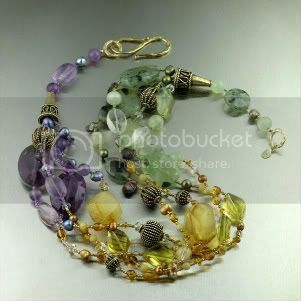 I really love the Amber, Prehnite, Amethyst, & Citrine Necklace. It is very original.